Sprint Offers Blackberry 7750 | BlackBerry Blast! Sprint PCS has finally decided to offer a Blackberry device. Sprint PCS is the last of the major wireless carriers to offer a BlackBerry. 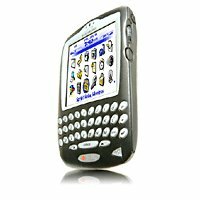 They released the Blackberry 7750 which has 14 MB of memory and a 2.9-inch color LCD screen. Sprint's web site lists a price tage of $549. Check out the link below for more details.